Guest post – Mathilde's Cuisine | eat. live. travel. write. Thanks to Mathilde for providing us with this wonderful “tour de France” – check out her lovely (bilingual) blog! All is set to make the best of the summer holiday. It’s now time to start your engines and get ready to enjoy a food specialty road trip of France. In Normandy, give a ‘l’Omelette de la mère Poulard’ or ‘Camembert’ a go. In Brittany, you can’t escape the ‘crêpes’ and ‘kouign amann’. Along the Atlantic ocean, you wouldn’t resist either the ‘foie gras’ or ‘confit de canard’. Further south, don’t miss the ‘Poulet basquaise’ or a few ‘boles de Picolat’. The beautiful south east will tempt you with a ‘ratatouille’ and a refreshing ‘Salade niçoise’. Spend an afternoon hiking through the Alps to prepare yourself for a ‘Gratin dauphinois’ or a ‘fondue savoyarde’. Swinging by the Massif Central, experience the ‘lentilles du Puy’ or ‘escargots de Bourgogne’. Heading back north east, it’s time for a ‘Quiche Lorraine’ with a glass of ‘Champagne’. 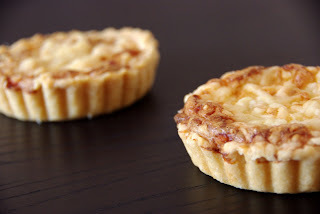 Finally, make your last stop in the north to enjoy a ‘gratin d’endives’ or a very tasty ‘tarte au maroilles’. For those who are ready for a little overseas travel to the French Islands, a ‘colombo’ or ‘acras de morue’ will bring you the sun you miss. Stretch the pastry into a tart form and put it into the fridge. Place the bacon in a pot of boiling water for one minute and drain. In a non-stick pan, fry the bacon for 5 mn at medium heat without oil or butter. Drain the bacon on absorbent paper. In a salad bowl, mix the eggs with the cream, the nutmeg, the salt and the pepper. Pour the mixture on the pastry in the tart form and cover with grated cheese (preferably gruyere). Place in the over for 40 mn. ← What to do when "the lettuce is out of control"